How can I receive notifications about new messages? You can change the design of your mailbox. Just choose a layout for your interface or use one of the suggested themes. How can I change the Yandex.Mail language? By default, Yandex.Mail uses a two-panel interface. 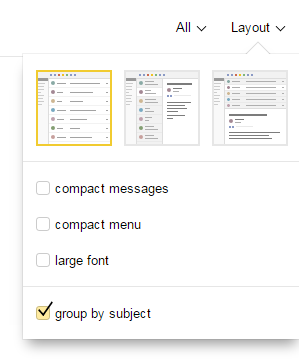 The message preview is displayed on a separate page to the right from the list of folders. You can also view a message in a list of messages in this interface: it will be displayed above the list. Click Layout (in the upper right corner). The three-panel interface makes it easier to handle emails; it uses a different email selection method. Enable the Layout → Compact message mode option (top right corner of the screen) and the messages will be shown more compactly. Enable the Layout → Compact menu option (top right corner of the screen) and your message list will cover the top line of the menu as well. Click and the list of folders will collapse, leaving icons that only display your folders with unread mail and system folders in its place. Go to All settings → Other. Disable Show only folders containing unread messages in the mail interface. 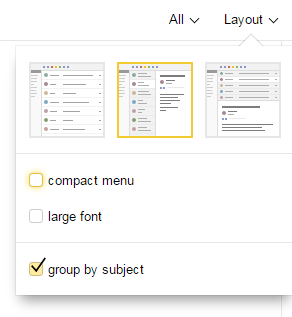 You can change the folder list width manually: place the cursor over the right border (it will look like ←||→), left-click and move the list border to the right or to the left. The light interface is intended only for basic operations with messages, such as creating, reading, viewing attachments, labeling messages, etc. Themes are not supported, and there is no way to configure custom buttons or message filters. To switch back to the fully functional default interface of Yandex.Mail, click Full version. You can adjust the size of the Yandex.Mail window. Hold the cursor on the right border and it will change to this: ←||→. Then left-click and hold while dragging the mailbox border to the right or to the left. You can select between a plain and thematic appearance for Yandex.Mail. To apply a theme, click in the upper right corner and then left-click the theme you want. And click in the upper-right corner. Click on the Colors theme. Go to Settings → Other. Enable the open message in list of messages option. 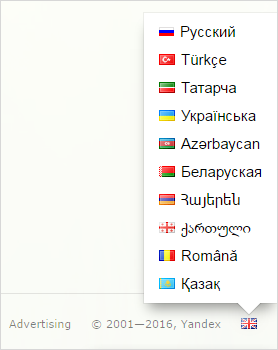 Go to All settings and select a language in the left column. If you can't change the interface theme or there are problems with formatting or buttons, try refreshing the page by clicking Ctrl+F5. Then clear the browser cache and set up your cookie parameters before trying that action again. Temporarily disable all plug-ins and extensions in the browser. Often they are the cause of Yandex.Mail errors. If ad blockers or antivirus extensions are causing problems with Yandex.Mail, then you can add the Mail page to the list of exceptions for that particular extension. It's also possible that you are using an outdated browser; install the latest version of your browser.